I read a LOT of picture books, and my first impression of Henry Hodges Needs a Friend (2015) was that it is pretty mediocre. The basic plot of a lonely child who finds a friend is tired, the rhythm and rhyme isn’t striking, there are no jokes or plot twists, and Colleen Madden’s illustrations are cute but nothing to write home about. My four-year-old, who reads even more picture books than I do, didn’t think that this one was worth reading a second time. The story is about Henry Hodges, who is lonely and doesn’t have any friends to play with. His parents promise to find him “a pet who, like you, is one-of-a-kind!” Henry imagines all sorts of one-of-a-kind animals, from flying hamsters to singing turtles with “wild, wavy hair,” but eventually he is smitten by a puppy he meets at a dog shelter. My daughter wants a puppy more than anything else in the world, and the appearance of a cute puppy is usually a sure-fire recipe for making sure that a book is going to be a success. Not this time. There is nothing about this book that is actually bad, and by the standards of the picture book market it is very competitive. But it didn’t do it for us. Tommy Nelson specialize in Christian picture books that are “to expand children’s imaginations and nurture their faith while pointing them to a personal relationship with God.” Although Andrews doesn’t frame this as a Christian story from the beginning, on the second last page he concludes that “If we’re lonely or sad, God knows just what we need. And for Henry, his Hap was the best choice indeed.” This helps children associate friendship and loving parenting with a God who cares for and looks after us, and makes a nice ending to the story. But then you turn over the page and read, “Henry didn’t need a funny pet, colored yellow or blue. But a one-of-a-kind friend, just like your friends need YOU!” The second ending seems superfluous, and feels like the second epilogue to War and Peace; when you’re finished and really just want to put the book down, turn the light off, and watch them drift immediately off to sleep (because kids do that), Andrews hits you with a second message that comes out of the same story. The weaknesses of Henry Hodges Needs a Friend are not Andy Andrews’ fault. The more time I spend with preschoolers, the more skeptical I become about using stories to teach spiritual lessons. I’m certain that this technique works for older children, but not preschoolers. I taught a Sunday school class to four and five year olds this week, for example, in which we were studying the concept of parables and allegory. 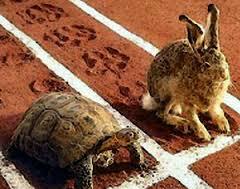 We started by talking about the hare and the tortoise; a story that they all knew very well. They all had an opinion about what the moral of the story was: “Don’t run too fast!” “Don’t nap too long!” “Don’t sleep when you are supposed to be racing!” We tried hunting for treasure because Jesus taught that “The kingdom of heaven is like treasure hidden in a field” (Matthew 13:44). They learned that hunting for treasure is fun, not that they should sell all they had to buy the field with the treasure buried in it. When we turned to Jesus’ parable about the wise and foolish builders (Matthew 7:24-27), what they learned was that you should build your house on rocks and not on sand. No amount of cajoling on my part could convince them that maybe the hare’s problem was pride, or that we need to do base on lives on Jesus, our Rock. I don’t think that I’m a bad teacher, but I do wonder how age-appropriate a lot of what we do in Sunday school really is. I’m not an expert on developmental psychology, and I would like to hear the opinion of someone who is, but perhaps instead of trying to teach concrete lessons, maybe we should just focus on loving these kids and helping them feel like church is a safe and fun space where they can explore deeply personal issues like faith openly and without judgement. 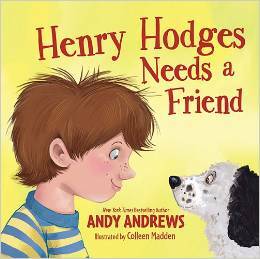 I would like to thank BookLook Bloggers for providing me with a review copy of Henry Hodges Needs a Friend. Thanks for those thoughts Thea. I love the idea of Batman rescuing Jesus from the cross! I come from an evangelical background that privileges head knowledge and rational apologetics, but the older I get the more I appreciate how important living a faith is not only for shaping how we think about God and what our presuppositions are, but also for teaching us how to love Him experientially. At a very basic level, until we meet God, no amount of catechization is going to convince us of His goodness. And that is precisely what “living experience” of worship during Holy Week does for us when we’re small. Thanks again, and God bless!